One Sabbath, when Jesus went to eat in the house of a prominent Pharisee, he was being carefully watched. 2 There in front of him was a man suffering from dropsy. 3 Jesus asked the Pharisees and experts in the law, “Is it lawful to heal on the Sabbath or not?” 4 But they remained silent. So taking hold of the man, he healed him and sent him away. 5 Then he asked them, “If one of you has a son or an ox that falls into a well on the Sabbath day, will you not immediately pull him out?” 6 And they had nothing to say. Do you ever feel like you’re being watched? Maybe you’re at home alone, and you get that feeling, and suddenly you turn around, but there’s still no one there. Or maybe it happens to you in a group setting. People are openly staring at you, and you wonder: Is there something in my teeth? Is there something wrong with an article of my clothing? It’s only later that you find out they weren’t really looking at you after all. Today in our Gospel Jesus has that same experience – only they really were watching Him. The Pharisees He sat down to dinner with were watching Him like hawks, trying to trap Him. They wanted to see what He’d do, so they could catch Him out and kill Him. But Jesus used that tense situation to heal a man, in the process giving us some valuable teaching. One wonders if the Pharisees sitting there took it to heart. They probably didn’t. At any rate, let us not be like them. Let’s listen attentively as Jesus describes The Wedding Feast for the Humble. Also at this dinner is a man with dropsy. Dropsy is not a sickness where you’re clumsy and drop things (if that’s the case, then I was born with it); dropsy is an older name for when fluids accumulate in the tissues of the body. We call it edema nowadays. There was something visibly wrong with this man’s condition. Jesus asks them, “Is it lawful to heal on the Sabbath, or not?” Of course the Pharisees knew the answer. God was not as strict on keeping the Sabbath as they were. Naturally, healing is permitted on the Sabbath. But they remain silent because they don’t want to agree with Jesus. They know He’s right, but they don’t want to admit it – so they stay stubbornly silent. So to uncover their sinful hearts, Jesus does two things. First He grabs hold of the man and heals him, right there on the spot, and sends him away. Then He asks them, “If one of you has a son or an ox that falls into a well on the Sabbath day, will you not immediately pull him out?” This is an even sharper question. Of course the Pharisees would do that for their ox. That’s a situation that requires immediate action – yet here they won’t even lift a finger to help someone who’s suffering right in front of them. But there’s nothing they can say, because Jesus convicted them where they sat. This is a problem to Jesus. He knows what’s behind their refusal to help. It’s the same thing that’s behind their jockeying for the prime seats at the very dinner they sat at. So to right their wrong attitude, Jesus tells a parable. Because this is a parable, right away we know that not everything He says has a literal meaning. This is a picture designed to teach us, so we are right in looking to discover the deeper meaning of Jesus’ words. This parable aims at the problem of wanting to be first, sinful pride in action. The only interpretation He gives is at the end: “Whoever exalts himself will be humbled, and whoever humbles himself will be exalted,” which is pretty clear from what He says. But let’s see if we can use others parts of Scripture to cast more light on Jesus’ teaching and fill it in here. First, Jesus speaks to those who were called to this dinner, that is, to those who are invited. Thus He speaks also to us, because we have been called as well. Many times we refer to our pastors as being called, and what that means is God leads a congregation to ask a qualified man to be their pastor. Really all Christians have been called: we’ve all been called to faith. God has called us to faith through water and the Word, and our whole lives are a response to His call to faith. St. Paul describes our common Christian calling beautifully in our Epistle for today: “There is one body and one Spirit – just as you were called to one hope when you were called – one Lord, one faith, one baptism; one God and Father of all, who is over all and through all and in all.” We all have the same grace from God, we all have the same status, we all have the same relationship of faith and trust in Him. Quite simply, we are one. That’s who we are. We are called to be one in Christ’s kingdom. Jesus begins His parable by saying, “When someone invites you to a wedding,” or we could even say, “When someone calls you to a wedding.” This is the beginning of our faith – when God calls us to trust in Him, and He gives us the power to trust in Him. This happens when we are baptized. That’s when each of us was healed from our sins. Jesus took hold of us personally in the healing waters of baptism. He held the head of our old Adam under water and drowned it, and He pulled us up out of the deep waters clean and fresh and pure in His sight. He washed our sins away by water and the Word, and He still does that today, through His comforting absolution. And then Jesus lets us go. He turns us loose to serve God and our neighbor, as His own cleansed, healed children, to serve one another and the world – to put others first so that God may be glorified in the world, and we may be exalted in due time. That is the calling we have received, as baptized, called, cleansed children of God. Jesus says we are called by Someone, and while He doesn’t elaborate on this in the parable, we know who has called us. We have been called by God the Father and “chosen according to His foreknowledge, through the sanctifying work of the Spirit, for obedience to Jesus Christ and sprinkling by His blood” (I Pe 1:2). The Father is the one who calls or invites us to the wedding feast. It’s called a wedding feast because this is one of Scripture’s pictures for Christ and the Church at the end of time. We are His Bride, whom Christ loves and sacrificed Himself for, and whom He protects and serves still. On the Last Day, our Bridegroom, Jesus, will return and take us away to be with Him forever. We will never be parted ever again – together forever, because He has taken away our sins and we are radiant and spotless and holy in Him. So Jesus is giving us a gentle reminder to look ahead with this parable He tells. Many of the parables Jesus told that used the picture of the wedding banquet teach us to be ready, as for instance the one in Matthew chapter 22, or the wise and foolish virgins in Matthew chapter 25, or the Master returning from the wedding banquet in Luke 12. At this wedding which Christ is pointing us to, where He and His Church are united, who gets the seat of honor? Christ does. He sits at the right hand of the Father in heaven, and He’s the only one who can sit in that seat. In many households there’s a chair in the living room that everybody knows is Dad’s chair. It’s where he goes when he wants to put his feet up after a hard day’s work, to watch a little TV or read the newspaper. Nobody else can sit there when Dad wants to because it’s his chair. In a similar fashion, Jesus is seated at the right hand of the Father – His rightful seat of honor. The right to sit in that seat belongs only to Him, because of who He is and what He’s done. Only Jesus is both God’s Son and true man. Only Jesus died and rose again to take away our sins. The book of Hebrews tells us, “After He had provided purification for sins, He sat down at the right hand of the Majesty in heaven. So He became as much superior to the angels as the name He has inherited is superior to theirs” (Heb 1:3-4). 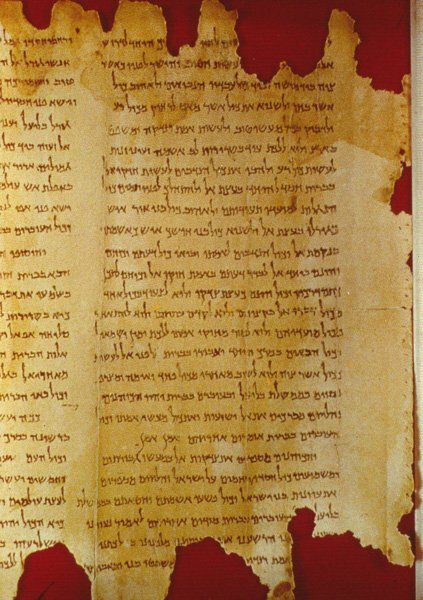 Later in Hebrews it says this: “After He had offered for all time once sacrifice for sins, He sat down at the right hand of God. Since that time, He waits for His enemies to be made His footstool, because by one sacrifice He has made perfect those who are being made holy” (Heb 10:12-13). That’s you and me. Jesus guarantees our invitation to the wedding. So Jesus deserves the place of honor at God’s right hand, because nobody else is the Son of God and the Savior. Brothers and sisters, you know who else had that separatist, elitist, holier-than-thou attitude? The Pharisees to whom Jesus told this parable. They too sat by themselves in their own little groups and watched others struggle and suffer, when they should have been standing up and reaching out their hands to help them. Lack of service equals lack of love. The reason this matters eternally is what Jesus says will happen next for the proud and arrogant: “Then the host who invited both of you will come and say to you, ‘Give this man your seat.’ Then, humiliated, you will have to take the least important place.” Or more literally, what Jesus says is very vivid and descriptive: “Then you will begin to take the least important place.” If everyone in God’s kingdom has the same call and the same grace – if we’re all invited to the same heavenly wedding – then the least important place isn’t at the wedding; it’s outside the wedding – in the darkness, where there will be weeping and gnashing of teeth. Jesus’ words here remind us of hell. This is how eternal punishment is described many times in the New Testament, although Jesus only refers to it obliquely here. Jesus is the Host in this parable, because He will judge the living and the dead. We might wonder, isn’t hell too harsh and severe a punishment for pride? I know it’s a sin, but is it really that bad? Yes, if your pride causes you to turn your back on Christ and reject Him and His work for you – and that will show up in the way that you treat your fellow believers. Refusing to love and serve others is trying to push Jesus out of the seat of honor. So how do we avoid being thrown out of the wedding? 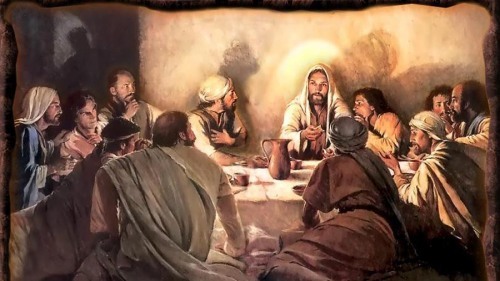 Listen to what Jesus says: “But when you are invited” – or we could say “called” – take the lowest place, so that when your Host comes, He will say to you, ‘Friend, move up to a better place.’ Then you will be honored in the presence of all your fellow guests.” Jesus’ advice is to humble ourselves, to choose the least important place in the wedding, so then we will be exalted in the end. How do you take the lowest place? First, by confessing your sins. Don’t try to be any better in God’s eyes than you really are. Bring yourself down and accuse yourself before the Father. Admit your sins and your faults and your mistakes, your pride and your hardness of heart. If we judge ourselves we will not fall under His judgment, for when we confess our sins He is faithful and just and will purify us from all unrighteousness. Then give up on your own works. Don’t put any trust or reliance in what a good person you are. Despair of your own works. Don’t think of them as anything good. Whatever you consider good or worthwhile about yourself, throw it on the fire and turn to Christ alone. Trust in Him only for forgiveness and eternal life. This is taking the lowest place. Then show that you believe this is true by putting others ahead of yourself. Think about what’s best for others before you think about what benefits you the most. Learn to look at others the way God looks at you – with compassion and tenderness, bearing with one another when you’re sinned against. Make every effort to keep the unity of the Spirit through the bond of peace – which will surely involve sacrificing your pride on more than one occasion. None of us particularly likes to put down our pride and put others first. Do it anyway, because Jesus put others entirely ahead of Himself. He became man and willingly served in this world for the good of others, even enduring the shame of the cross. He is your example. Imitate Him, and put others first as He did, because Jesus promises that when you do, you will be lifted up – you will be exalted. You will be exalted through God’s grace and the forgiveness of your sins, because putting others first is proof positive that you have a living and active faith, and that faith brings forgiveness and God’s favor with it. “[God the Father] raised [Christ] from the dead and seated Him at His right hand in the heavenly realms, far above all rule and authority, power and dominion, and every title that can be given, not only in the present age but also in the one to come” (Eph 1:20-23). And God the Father has raised us with Christ and seated us in the heavenly realms in Christ Jesus, in order that in the coming ages He might show the incomparable riches of His grace, expressed in His kindness to us in Christ Jesus” (Eph 2:6-7). God has already lifted you up! You’re seated with Christ in the heavenly realms! Your sins are forgiven and you are His forever! The Son of God Himself calls you “Friend,” for everything He heard from His Father He has made known to you. You know how He has had mercy on you and He has raised you from the ash heap to sit with the princes of His people, all the saints and angels in heaven. You can look forward to the day when all the world will be gathered to the Judgment, and before everybody Jesus will say to you, “Come into the kingdom prepared for you since the creation of the world, you who are blessed by My Father – for I was hungry and you gave Me something to eat, I was thirsty and you gave Me something to drink, I was sick or in prison and you visited Me” – and you’ll say, “When did I do that, Lord?” And He will answer, “Whatever you did for one of the least of these, you did for Me.” Then you will be honored before all your fellow guests at the wedding. To help you look forward, stay strong, and be humble until that day, Jesus gives you a little foretaste of the heavenly feast here today – His holy Supper. Here the Lord Himself is Host and guest — as well as the blessed Food we eat and drink! Here today He humbles Himself to feed and care for you, as you come to His altar and receive His body and blood. Your sins are forgiven and you are honored to have Christ with you, just as it will be on the Last Day and forever in heaven – and it’s here for all who are humble, weary, and heavy laden. May we all live in humility so that Christ is exalted in us, who with the Father and the Spirit lives and reigns forever, Amen. No one can serve two masters. Either he will hate the one and love the other, or he will be devoted to the one and despise the other. You cannot serve both God and Money.25Therefore I tell you, do not worry about your life, what you will eat or drink; or about your body, what you will wear. Is not life more important than food, and the body more important than clothes? 26 Look at the birds of the air; they do not sow or reap or store away in barns, and yet your heavenly Father feeds them. Are you not much more valuable than they? 27 Who of you by worrying can add a single hour to his life? Jesus especially applies that truth to money. Money seems to have unusual power over people, and that power isn’t always good. For that reason, money sometimes has a bad reputation, even though we have to deal with it every day. The power money has isn’t in money; it’s in our sinful hearts. Our sinful flesh wants to lust after money and what it can buy, but we still want to call ourselves Christians. So Jesus’ warning is very much in place for us. We could easily start to lose our fear of God if we love and serve money first. We can tell ourselves, “Oh, yeah, I’m a Christian, I love God,” while we begin to love and serve money as our god instead. How can we tell if we’re starting to fall into this sin? One way to tell is by looking at what we worry about. 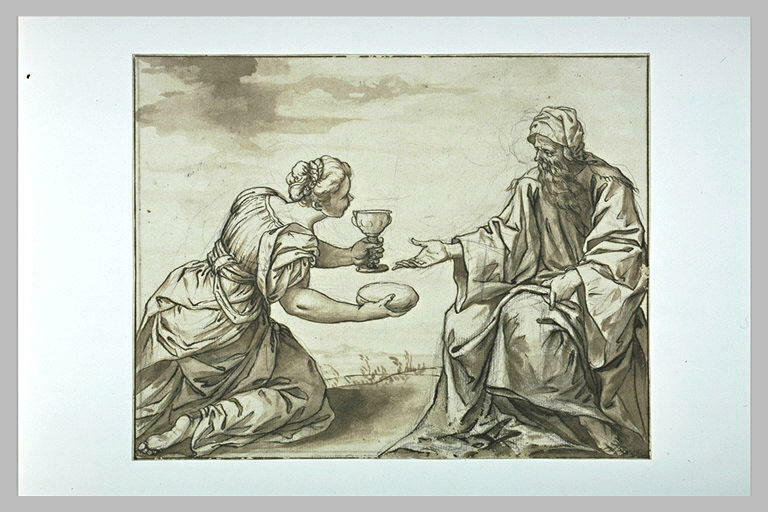 In chapter 12 of his book the Lord told the prophet Ezekiel to eat his bread with trembling and drink his water while shuddering with fear. This was meant as an action prophecy, a way of illustrating the effects on the people of the violence that was about to come on the land of Judah. We too eat our food in anxiety and drink our water in despair, but not always for the same reasons as Ezekiel. Every day we wake up, and our thoughts turn immediately to the day. We think of the work we have to do, or what needs to be done, and our minds start to spin. An astonishing amount of that mental activity is wasted and useless. Many times we’re just worrying. Worry isn’t a bicycle, it’s a hamster wheel. It just goes round and round and you never get anywhere. One of the biggest things people worry about is money. We worry we won’t have enough. We worry that our money will fall short, that we won’t be provided for – so we work harder. We burn the candle at both ends, sacrifice and give things up so that we can feel sure that we’ll be fine. We even tell ourselves that’s what it takes to make it – sacrifice even time in God’s house, hearing His Word, on the altar of making money. Money is a dead god that demands all our service and doesn’t do anything for us in return. We work so hard for it, we pay attention to it and watch over it, we fret and worry over it, and yet it doesn’t do what we want it to. People say you need money to live, but you can’t eat gold. Having money in the bank doesn’t put air in your lungs or open your eyes or make your heart beat. It doesn’t bring you any closer to God and it sure doesn’t deliver you from death. Ask any number of misers who have died with mattresses and coffee cans stuffed full of bills that they weren’t able to spend once they breathed their last. If you’re serving money, you’ll never have money enough. Jesus talks in His teaching about spinning thread, or reaping and sowing, but for us serving money might look like asking for more overtime, or putting in longer hours, or getting a second job – or it might actually be planting and harvesting, if that’s what you do. All our furious activity and hard work might just be a cover-up for other things we don’t want to think about, or other duties God has given us that we don’t want to do. If all this hard work and activity comes from worry, it’s sinful. Because He’s promised to in His Word. In fact, you don’t even have to be good and holy for God to provide for you every day. He makes the rain to fall and the sun to shine on the just and unjust alike. God still feeds and clothes and houses you even if you don’t believe in Him or do what He says. How’s that for a loving and faithful God? If you’re still so worried that your worry prevents you from listening to His Word – because that can happen; people get so anxious about jobs or finances or what have you that it’s like they can’t even hear the Word – then take a look at the flowers. They’re all beautiful, right? Look at the beds of flowers in front of church, or in your yard or your neighbor’s yard. Even dandelions – weeds! – have cheerful, bright yellow heads. Or those tall weeds that grow at the edge of your lawn – I don’t even know what their name is, but they have such vividly beautiful purple flowers on them. Such a riot and profusion of colors and hues. Why would God take the time and trouble to make even the weeds in your lawn look pretty? To remind you that you have enough because He is taking care of you, every day. Or look at the birds. They’re not anxious or crabby when they wake up in the dawn’s early light, are they? Who ever heard of a grumpy robin? Yet the birds never worry. They never lie awake at night thinking in their little bird brains, “Will I find enough to eat tomorrow? And what about the day after that, and after that? What if I get hurt – then what? I’m doing okay now, but what if things get a little tougher at work? What if they cut my hours? I’ve heard rumors that layoffs are coming – what if that’s me? What will I do?” Birds never act that way! If anything, they wake you up at the crack of dawn because they’re singing so loudly and cheerfully to God. Why do they sing like that? They’re thanking their Creator for giving them another day and caring for them. Listen to the birds sing. Let them remind you that God will care for you just as surely as He cares for them. He will prosper your work and establish it for you. He will protect you and provide for you – always. That’s a promise you can count on, because He clothes the flowers and feeds the birds, and aren’t you much more important to Him than they? Of course you are! Besides, the Heavenly Father knows you need all these things. It has not escaped His notice that your kids need shoes, and your car needs gas, and all the dozens of other necessities we spend our money on. He sees, and He knows. He will not let the righteous starve. You have no need to worry, because He cares for you. It would be a mistake to look at Jesus’ words in this gospel and conclude that He means that we don’t have to work, we should just sit back and wait for God to drop a living in our laps – wait for the roast goose to fly into our mouths, as Luther used to say. From elsewhere in Scripture we know that hard work is ordinarily the way God provides for us. God nearly always uses means when He does His work, whatever it might be, and in this case the means He uses is our own sweat and effort. Genesis 3 reminds us that by the sweat of our brow we eat our food, and 2 Thessalonians 3 tells us that if someone will not work, he shall not eat. This is so that we have something to share with those in need, which is good and pleases God our Savior. Jesus’ words here don’t remove the need to work for our daily bread; what they do remove is the fear or worry or anxiety that often drives us. Jesus’ words take away worry and replace it with faith – faith that God will provide, and that He will provide until He provides. So often we’re willing to grant that God will provide, but that seems too far away & remote and we need help now. God will provide, and also provide until He provides. God promises to take care of us, and does take care of us, partly to free us up to focus more on Him and His Word. We could easily think, “I don’t have time to waste on God; I don’t have time to hear or read His Word. That’s fine for other people but me, I need to work for a living. How else is my family going to eat otherwise?” So to free us up and allow us to spend more time with Him and His Word, God promises: “You will always have enough. I will provide for you every single day, without fail. Now come meet with Me in My house, in My Word, at My Table. There will be opportunities and chances to make money later on – but for now, come away with Me and get some rest.” God’s Word is like a passing rain shower that does not often return where it once was. Once it passes on, it might be too late – so seek the Lord while He may be found, and all these other things will be given to you as well. I don’t think it’s a coincidence that this Gospel was heard every year, just about this time – late summer, early fall, right around harvest time – for over 1500 years. At this time of year, when everybody is most concerned with reaping and harvesting, the Church reminds her children: yes, it’s right and proper to work hard at the work God has given you to do. That’s His will for you. Work long and hard when you have to – but don’t forget God. Honor Him by trusting in Him for everything, forgiveness of sins and daily bread alike. Take His Word over your worries and fears. Don’t forget what’s of eternal importance even as you do work that’s of great earthly importance. Remember who is Lord of the harvest. No matter how the harvest goes, whether it’s profitable or just barely enough, or even not enough – God will still provide for you. He always has and He always will, so don’t forget Him. Seek first His kingdom and His righteousness, and all these things will be given to you as well. “Seek first His kingdom” means to look for God’s working in your life, and the first and foremost place to look for that is in His Word and the Sacraments. That’s how God gets His work done. That’s what He uses to accomplish His will. Focus on God’s Word as the goal of your life, not on what you do to make money. That’s important too, in its place, but what you do for a living won’t last forever. Too often what we work for doesn’t even last in this world. Thieves break in and steal. Moth and rust and bad weather destroy. Eventually your dust returns to the ground and your spirit to God who gave it, for in the grave, where we are going, there is neither working nor planning nor knowledge or wisdom. Some day all your work will be taken from you. Everything you’ve worked for will be taken out of your cold dead hands, and then what? Only the kingdom of God within you will save you: the faith that God worked in your heart according to His promise, when you heard and learned His holy Word. Put God and His Word first in your life, and Jesus assures you that all these other things will be given to you as well. Each day has enough trouble of its own, or as the King James says, “Sufficient unto the day is the evil thereof.” It’s oddly comforting that “sufficient to the day is the evil thereof.” We don’t have to be responsible for tomorrow’s evils as well as today’s. Tomorrow never comes, anyway. We don’t have to take the fall for everything bad that’s going to happen in the future. Today’s is enough, and really we don’t have to bear the burden of everything bad or adverse that sets us back today. We don’t have to overcome it or battle it back and win out over it. God promises to provide for us every day – today & tomorrow both. What are we worried about? It’s all in God’s hands. He’s the one who will deal with it in His time. God takes everything we worry about for tomorrow gently out of our hands, and He smiles and says, “Here, I’ve got that. Let Me hold that.” Then He says, “Here, have this instead” – and He pours out on us the flood of blessings we see and use every day, many times without thinking about it. Thanks be to God for taking care of us, day by day, until at last we reach our heavenly home. Amen. Have you ever been hungry for something, but you didn’t know what it was? Maybe that’s a problem that we in well-fed America have, but sometimes you want something to eat and you can’t figure out what it is. You might not even feel any hunger in your belly, but you just want something and you’re not sure what it is. In our Gospel for today, Jesus converses with crowds of people who don’t really know what they want. They think they want one thing, but what they’re looking for is really something else entirely. Let’s listen as Jesus teaches us about The True Bread that Satisfies. It’s worth noting, before we consider Jesus’ words in more depth, that this account takes place right after the feeding of the 5000 in Galilee. By feeding a crowd of 15-20,000 plus with only five small barley loaves and two fish, Jesus did a miracle whose significance the people immediately grasped, even if they didn’t understand it fully or rightly at the time. The idea that Jesus could feed them indefinitely, without work, on earthly bread will be in the back of their minds the entire time the crowds are talking with Jesus. It helps us to understand why they say what they say. “Once the crowd realized that neither Jesus nor his disciples were there, they got into the boats and went to Capernaum in search of Jesus. 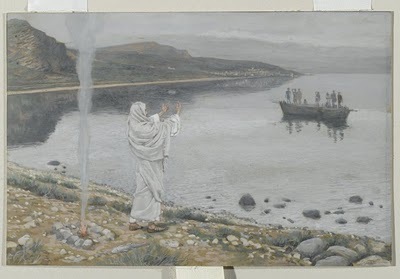 When they found him on the other side of the lake, they asked him, “Rabbi, when did you get here?”” The crowds display a lively interest in Jesus, but their interest is far from healthy. It’s sick with selfishness. They’re motivated by their own greed and their own self-interest. They also show what they think of Jesus by addressing Him as “Rabbi.” They seem Him as only a teacher who can work miracles, nothing more. They certainly aren’t viewing Him as God’s Son here. Yet Jesus bears with their selfishness, and He speaks patiently with them, to bring them around to the truth about Himself. Jesus doesn’t answer the question they asked, because He knows why they came looking for Him. He calls them out for their selfishness. He says, “I tell you the truth, you are looking for me, not because you saw miraculous signs but because you ate the loaves and had your fill.” In the Gospel of John, signs are miracles that are done to point the viewer to Christ. They attest to His divinity. They’re a form of proof that He is who He says He is. Jesus’ words imply that He would have been fine with their seeking Him out after seeing the miraculous signs He did – that would at least mean that they came to Him for spiritual reasons, even if they might have been misguided or misinformed to begin with. But they don’t even come for that reason. They come because Jesus filled their bellies, and they want more of that. His miraculous feeding of the crowds seems to promise a life of ease, guaranteed security, all their needs taken care of. If we make Him king, we’ll be set for life, the crowd thinks. That’s the only reason they came seeking Jesus. It’s sad but true that too many today come to Jesus for the same reason. Prosperity preachers pack stadiums with slick messages designed to get their hearers to tune in and open their wallets. They promise earthly prosperity and security, health, wealth, and happiness, for those who follow God – although God Himself never promised as much as they do. They teach that earthly prosperity is a sign of God’s favor, and God wants His children to drive new cars and live in big houses, take fancy vacations, and have the good life. Those who listen, rapt, never seem to notice that the only ones getting rich are the prosperity preachers! Such teachers tailor their message to the itching ears of their hearers. They scratch the itch that Jesus steadfastly refuses to – to cater to the earthly mindset of the flesh. Yet even we need to beware of that same urge, wanting security and prosperity in this world at any price. Think about your prayers that you pray the most. How many of them are for physical necessities? How many of them are for spiritual needs? Jesus has promised us that we will all receive daily bread, whether we are wicked or righteous. Yet when it comes to the needs of the soul, we are indifferent in our prayers, cold, sluggish. Why is that? We have the same tendency as those crowds did, to be earthly minded only and not to seek the higher, spiritual, things of God. We also need Jesus’ rebuke, and the encouragement He offers next. “Do not work for food that spoils, but for food that endures to eternal life, which the Son of Man will give you. On him God the Father has placed his seal of approval.” We all work for food that spoils. Our time and sweat and the headaches that go along with working for a living all bring a paycheck that goes in part to pay for food that doesn’t even last. Leave a gallon of milk or a cut of meat out on the counter too long, and you’ll see – and smell – the truth of Jesus’ words. By saying this, Jesus isn’t telling us not to work and earn enough to support ourselves; that is clearly taught in Scripture as God-pleasing. The Seventh Commandment, “do not steal,” among others, teaches this. What Jesus means is that it shouldn’t stop there. There’s more to life than just feeding and clothing yourself, and your children, and having enough left over to have some fun. We were meant for more than that. Too many today are content only with food that spoils. They think that what they can see and feel and touch is all there is to life, and there’s no point in seeking anything more. People who think that way are little better than animals, “brute beasts, creatures of instinct, meant only to be caught and destroyed,” St. Peter tells us – “and like beasts they too will perish.” If all you care about and want are the things of this world, then you’ll perish and pass away along with this world. Instead, Jesus says, “work for food that endures to eternal life.” Since the crowds were so interested in food and in working (or not having to work), Jesus replies in kind. He speaks the way they do, in order to draw them in. His talk of eternal food piques their interest. Jesus also points to Himself as the sole distributor, the only source, of this eternal food. It’s found in no one else except Him. If He doesn’t give it to you, you don’t have it. As proof of this, Jesus refers to Himself as being “sealed” by the Father. Scripture speaks of the Holy Spirit being given as a seal of things to come. It’s like when you get a document notarized or witnessed – the notarization attests that what the document says is valid and true, and will happen. In the same way, God gives the Holy Spirit as a seal or a clear, public mark to others. Jesus received the Spirit for a different purpose and for different reasons than we do. When He was baptized, the Holy Spirit descended on Him. Thus He was sealed with the Holy Spirit. This was a public sign to all people of who Jesus was: God’s Son, sent from heaven, and the Christ, God’s chosen one to bear away sin and bring salvation. Throughout His ministry Jesus did miracles and healed people by the power of the Holy Spirit. The Spirit was in the powerful Word Jesus preached. The Spirit convicted sinners and changed the hearts of His hearers. Jesus served by the power of God’s Spirit throughout His whole ministry, and at His death on the cross He handed back the Spirit to God who gave it. Then the Father raised Him from the dead, so that Jesus could fulfill His promise made before His death that He would send the Holy Spirit to His own, to remind them of what He said and to lead them into all truth – so that we might all be one, as He and the Father and the Holy Spirit are one God. This was according to His human nature; of course, as true God Jesus always had the Spirit without measure. However, Jesus received the Holy Spirit by the exact same method we do: through God’s Word and baptism. It was the same Spirit, for different purposes, but given the same way. That Spirit Jesus received shows publicly that this is the Christ; that this Man, God’s Son, is your Savior. Jesus’ answer piques the crowd’s interest. Now He’s speaking their language. They get this. They want to know more, so they ask Him, “What must we do to do the works God requires?” Really, all people ask this question. We have it in ourselves, because God has planted it in our hearts. He made us so that we would seek Him and reach out for Him, and perhaps find Him, though He is not far from each of us. Every human ever born feels a yearning in their heart to know what we must do to do the works God requires. Different people answer this question differently, all the way from, “Do your best and the ‘Man Upstairs’ will be happy,” to “There is no God, He doesn’t exist.” People who say that go against their consciences, which is why they feel driven to blaspheme so regularly and so horribly – because they know it’s not true. All people know, on some level, that they are responsible to God. We all owe Him something – what it is, we don’t know by nature, nor can we, but we feel like there’s something we should be doing for Him and usually we’re not doing it. Jesus answered, “The work of God is this: to believe in the one he has sent.” Jesus’ answer is brilliant because it takes their wrong preconceived notions and flips them on their head. The crowds were focused on works – doing things to make God happy. One might argue that’s because they were raised as Jews and the Jewish religion had taught them to go through the motions, but really the reason is that they were human. All people want to do something to make God happy. They want to earn God’s favor by their hard work, their good attitude or their good behavior. People will work themselves half to death, day and night, trying to do something that they can be sure will make God happy – whether it’s one of God’s actual commandments, or more likely, one of their own made-up good deeds that they decide will please God (which, if you think about it, is pretty insane.) All such working to earn God’s favor is worthless in His sight! Only one thing saves: trusting in the name of His one and only Son; believing that He alone has suffered all, done all, been all, that God requires, and that He alone – not anything in us or by us – makes us sufficient in God’s sight. The “work” Jesus points us to isn’t “work” at all! Faith in Christ is the beggar’s outstretched hand that pleads to be filled – and God does fill it, with love, with forgiveness, with mercy and compassions new every morning. If you want to make God happy, give up trying to make God happy. Instead, despair of everything in yourself that you ever thought was good or worth something, and turn to Christ His Son, the only one who has truly ever pleased God. All people act this way toward God. We all want concrete proof right before our eyes before we’ll entrust ourselves to Him. We adopt a challenging attitude toward Him, as if to say, “What have you done for me lately, God?” – but then the minute that it looks like things are starting to fall apart or turn sour for us, our first thought is, “How could you do this to me, God? I thought You loved me!” Yet the proof of God’s love was there all along, in the person and work of His Son, Jesus Christ. Jesus keeps His balance and doesn’t let them goad Him into something rash. 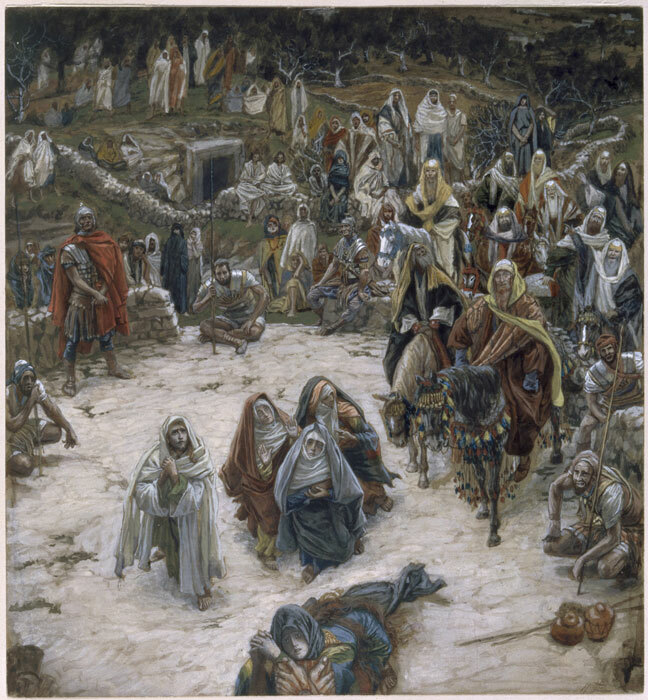 He redirects them by reminding them that it wasn’t actually Moses that gave the manna, it was God, and God still gave them true bread, “for the bread of God is he who comes down from heaven and gives life to the world.” In saying that God “gives” them true bread from heaven, we’re reminded of everything involved in Jesus’ life, death and resurrection; everything, from His incarnation of the Holy Spirit and the Virgin Mary, all the way through the good news of His kingdom being preached in all the world, is included here. First Jesus was given to us as the holy Child prophesied – given into the womb of the lowly Virgin, God’s Son given as the Savior by becoming one of us, for us. God gave His Son to be made man so that we might be like God. In choosing to come down from heaven to this rotten, broken world, Jesus took the first steps in our salvation. 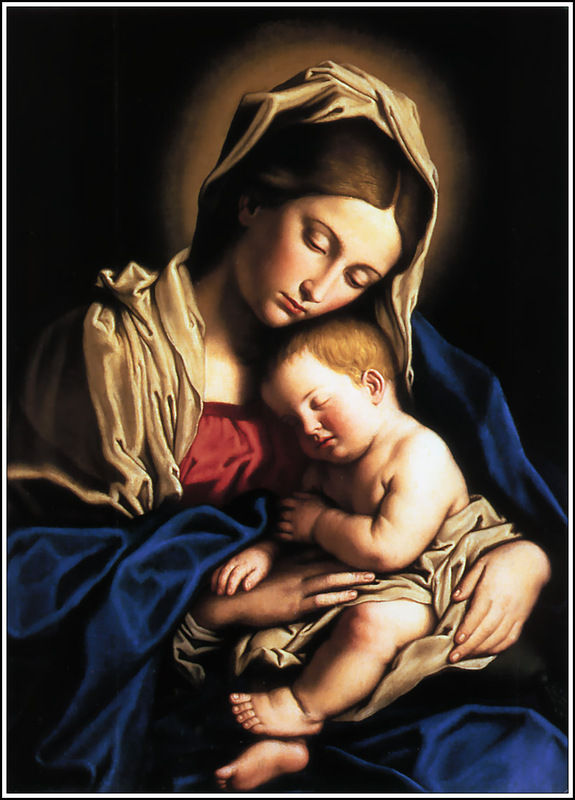 The Father gave Him into the womb of the Virgin for us, to redeem our conception and birth in sin, and He continued to give Him up throughout His life on earth. At last He gave Christ up so that He would be the spotless sacrifice, the object of the wrath of God and man, to satisfy God’s anger over sin. By taking God’s law upon Himself, by living as one of us, and by dying to pay for the sins of the world, Jesus has given life to the world. Now everyone who has faith in Him has eternal life. Whoever is an heir of eternal life in this world, they’re an heir because of Jesus. Jesus Himself explains what it means that the Father gives the true Bread from heaven when He says, “For the Bread of God is He who comes down from heaven and gives life to the world.” The two parts of that statement cover everything about Jesus, who He is and what He’s done – His heavenly origins, how He came to be in this world, why He was here. It’s all there. Even in their worldly state, these jaded and greedy people catch that there’s something valuable and wonderful about Jesus’ words. He has their attention, all right; He has them right where He wants them. So they ask, “Sir, from now on give us this bread.” They don’t even fully know what they’re asking for, but they want it. It sounds wonderful. And Jesus’ answer is even more wonderful yet: “I am the bread of life. He who comes to me will never go hungry, and he who believes in me will never be thirsty.” Whatever we need, whatever we feel we lack, whatever we crave, we find in Him. He is the answer to all our prayers and the means of our answers. He is the sum total, goal, and guide of our lives here on earth, and the sole joy, love, and devotion of our hearts for all eternity. Whoever comes to Him will never be disappointed. He is everything we need, both now and forever. The food Jesus gives us is…Himself. He gives Himself to each of us, offers Himself wholly, righteousness, love, and all, and says, “I am the Bread of Life. I satisfy your soul – I, and no other. Do not doubt, but believe that it is so.” Nobody and nothing can satisfy us and keep us going like He can. Nothing else nourishes the soul and keeps it alive like Christ our Lord. There is no substitute for Him – simply none. So that means you don’t need another vacation or another weekend, you don’t need more drugs or another drink, you don’t need more money or more attention or more praise, you don’t need any of the thousand different forms of sin we falsely comfort ourselves with; you don’t need to feel a certain way or be a certain kind of person – you need Him. Period. He alone feeds our souls. He alone keeps our spirits alive and preserves them uncrushed by the vicissitudes of life. Our whole lives consist of learning to rely on Him, and to the extent that we do not, we hunger. The soul who learns to rely on the Bread of life alone will never lack any good thing. No harm can touch it, for God bends all ills to serve the Christian through bearing the cross. No prosperity or benefit can outshine Him in our hearts. He is always first, last, and everything; and when He is, He preserves us and brings us to Himself in heaven – where we will have Him for our very own throughout eternity. And no Christian who has been taught to love the Lord Jesus will want to stop short of His altar, where He gives Himself to all His own along with the bread and the wine. The Bread of Life feeds His people here on earth to strengthen them for their journey, and to prepare them for the heavenly country where they will want no more, because they will see His blessed face. May Christ, the true Bread that came down from heaven, feed us and nourish us, until at last we rest in Him. Amen. Later, knowing that all was now completed, and so that the Scripture would be fulfilled, Jesus said, “I am thirsty.” 29 A jar of wine vinegar was there, so they soaked a sponge in it, put the sponge on a stalk of the hyssop plant, and lifted it to Jesus’ lips. 30 When he had received the drink, Jesus said, “It is finished.” With that, he bowed his head and gave up his spirit. Why does everybody sit so far back in the church? Why does everybody hang so far back in the sanctuary? Every time we worship, unless it’s a very full service, I’m presented with a view of at least four and more like eight rows of empty pews in front of me. I don’t mind, because my prescription for my glasses is good. I’m just glad that you’re here at all, but why do we always gather in the back? I have a hunch that we don’t want to get too close to God. With our rational minds we know that God is everywhere and getting close to God doesn’t have to do with where you sit in church, but still there’s a part of us that doesn’t use reason or logic that leads our feet toward the back of the church. Think about what’s in the front of the church: that’s where His Word is read and preached. That’s where His Supper is blessed and given to the people. Sometimes I get the very distinct impression that people don’t want to get too close to God, but they still want to be here or know they need to be here – so they sit in the back. But really, shouldn’t we want to be close to God? Isn’t God loving and welcoming? Maybe we’re right to want to sit in the back. Sinners cannot stand in the presence of the holy God. After Adam and Eve sinned in the Garden, God asks, “Where are you?” Adam is forced to say, “I heard You in the garden, and I was afraid because I was naked, so I hid.” Adam didn’t just not have clothing – he no longer had the perfect holiness God had created him with. People have been trying to get away from God ever since. In the Old Testament the fact that sinners can’t approach the holy God directly was made very clear to the people. Only certain people could go into certain areas of the temple or the tabernacle, and sometimes only on certain days. The holiest place was the Holy of Holies, where the high priest would only enter on one day per year, the Day of Atonement, and never without blood. While the children of Israel wandered in the wilderness Nadab and Abihu, priests and sons of Aaron, were so bold that they took their censers and went before the Lord to offer incense to Him. Leviticus chapter 10 calls it unauthorized fire, something God never commanded them to do. Fire came out from the Lord and burnt them to a crisp. They looked like something you’d scrape off the bottom of your grill. Korah, Dathan, and Abiram were Levites who led a mutiny against Moses in the wilderness. They said, “We’re just as good as you are, Moses! We want to be priests too!” They thought they should be able to go into God’s presence when He had not called them to do that. Then the earth opened up and swallowed Korah, Dathan, Abiram, and their families, and fire came out from the Lord and consumed their 250 followers. The Lord told Moses to pick the censers out of the ashes of the rebels and hammer them into plates and plate the altar with them, so that the people would see those sheets of metal and never forget their absolute need for the Lord to make them holy before they entered His presence. You know, the more I think about it, maybe it’s a good thing not to sit too close to the front. Our hearts are sinful just like Nadab and Abihu’s and Korah and Dathan and Abiram’s. You never know what will happen. The only problem with that idea of not getting close to God is that God wants to get close to you. Really close. How close? Try this: the eternal God became a human, just like one of us. The almighty God wanted so badly to get close to you that He took on flesh in the womb of the Virgin that He could live for you in your place and give God the perfect life you never could. He became just like you because He wanted to experience what it was like to be you, tormented by the devil and tempted to sin and despair, so you could experience eternity like He does – perfect, holy, sinless, and free. He wanted to share your flesh out of love for you, so that you would not be without an Advocate before the Father. Not close enough yet? God wants to get even closer yet to you. So here’s what He does: after He takes on human flesh in the womb of the Virgin, after He’s born and grows and teaches and heals, He allows Himself to be arrested and beaten and mocked. He’s whipped and finally nailed to a cross – and all the while, His life is running out with His heart’s blood. Every beat of His heart brings Him nearer to the end. Now here He is, staring His own death in the face – the place where we all must stand one day. We all have to look death in the face and know it’s coming for us, because we’re all sinners – so He wanted to die too. God doesn’t die; He’s eternal. But a man can die. So God became man to die in your place. Jesus really was true man. You can tell that here, because He cries out that He is thirsty. His body cries out for just a drink of water, something, anything. But He is not just a man, because of what He says at the end: “It is finished.” It. Is. Finished. Not just His life, not just the end of all a man’s hopes and dreams as His life runs out on the cross, but the full and complete payment price for all sin – your sin, my sin. All gone, dissolved, wiped out in the final payment of the debt, because it’s God’s Son hanging on that cross. In Jesus’ day merchants would write tetelestai, “it is finished” in Greek, on the bottom of their bills. Paid in full. Nothing left – nothing more to give. That’s what Jesus has done for you, because He wants to be close to you. He wants you forever in heaven with Him, and the only way that was going to happen was if He paid for your sin – so that’s what He did. Not close enough yet? God gets even closer to you — here, today! When you come to the Holy Communion, you receive the same Body that hung on the cross on Good Friday, the same Body that was whipped and scourged and that bled for you. You receive the same Blood that was spilled by the Roman soldiers, that ran down the wood of the cross and dripped into the dust on Golgotha. Along with it, you receive all the benefits of Jesus’ suffering and death. Jesus gives you everything He won on the cross: forgiveness of all your sins, perfect purity and holiness in God’s sight, the promise of salvation, the right to call on God as your Father, eternal life in heaven. No, I can’t explain how that works, but it’s true because He says so: “This is My Body, This is My Blood.” Jesus knew that you would not be able to come to Him, to get close to Him, so He wanted to get close to you, and that’s why He gave you His holy Supper. 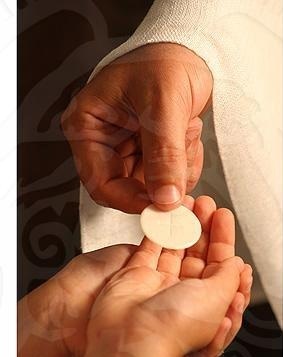 He wants to be so close to you that not only did He become true man for you, not only did He choose to die on the cross and pay the full price for your sins for you, but He also comes to you here today through the Sacrament of the Altar – to say to you in a way that needs no words, “I love you. You are Mine. I will never leave you nor forsake you.” Jesus wanted to be so close to you that He gave Himself into death for you on the cross, and He still wants to be so close to you that He gives Himself here to you today. So when it’s time, do come forward. Come to the front of the church, and let Jesus come to you, because we can’t go to Him. Get close to God in the way He wants you to, because He wants to be close to you. Amen. 2 The evening meal was being served, and the devil had already prompted Judas Iscariot, son of Simon, to betray Jesus. 3 Jesus knew that the Father had put all things under his power, and that he had come from God and was returning to God; 4 so he got up from the meal, took off his outer clothing, and wrapped a towel around his waist. 5After that, he poured water into a basin and began to wash his disciples’ feet, drying them with the towel that was wrapped around him. 10 Jesus answered, “A person who has had a bath needs only to wash his feet; his whole body is clean. And you are clean, though not every one of you.” 11For he knew who was going to betray him, and that was why he said not every one was clean. When you’re gone, how will people speak your name? Will they say your name fondly, with a smile? Or will they grimace and shake their heads? When your bones are six feet under and all that anybody knows about you is what the people who knew you say, what others think of you? Even if your answer is, “I don’t care,” it’s still a fair question, because it reflects the way you live right now. Another way to ask it is: what will your legacy be? Will you be respected as a pillar of the community, beloved in your church, looked up to by all who knew you? Or will people describe you with phrases like “a real piece of work”? Many times the legacy we leave is built up over time, and small actions when few or none are looking, words spoken without thinking, even an attitude, can have the biggest impact on others. In our Gospel for this evening we see Jesus leaving His legacy for us, His followers. His whole life was for others, but this night was special. Tonight He shows His own the full extent of His love. Let’s watch and learn about a Legacy of Love. It was supposed to be their last quiet evening together. Jesus knew what was going to happen to Him soon, even if His disciples had no clue, but this was not a quiet, intimate evening with the best friends He had on earth. On their way up to Jerusalem, James and John had asked Jesus for special seats of honor in His kingdom, which provoked the other disciples to jealousy. Jesus had to stifle their quarreling by pointing to a little child as the example of humility and faith. He had to rebuke them. Now they’ve come to Jerusalem, and they arrive at the upper room where they will celebrate the Passover. The owner of the house knew that Jesus didn’t want to be disturbed in His time with His disciples, so the owner hadn’t provided a household slave to wash their feet when they came in, as was the custom. Instead, he had set the pitcher, the basin, and the towel, neatly folded, by the door of the upper room. The apostles had filed past it, and each of them had glanced at the pitcher, the basin, and the towel, and then looked away. They all wandered in and took their seats at the table. None of them were going to wash feet. Are you kidding me? That was the job for the absolute lowest slave on the totem pole in the entire house. None of them wanted to do that. So they recline at the table for the Passover meal. The meal goes on, and still none of them wants to wash the feet. In fact, some of them start pointing out others in the group – “hey, you wash them.” “Me? No, I shouldn’t do it – he should. Here’s why” – and pretty soon they’re bickering about who’s the greatest among them. Nobody is willing to volunteer and draw the short straw and wash the feet. Finally, part way through the meal – long past the time that the feet normally were washed – Jesus stands up. St. John lets us see what He was thinking in those moments. “Jesus knew that the time had come for Him to leave this world and go to the Father…He knew that the Father had put all things into His hands, and that He had come from God and was returning to God.” Jesus was always conscious of His divine origins and His heavenly mission. He was true God and He knew it, begotten of the Father and yet one God with Him, the Firstborn over all creation. If anybody in that upper room had the right to stay seated and not wash feet, it was Him. Add to that what Jesus knew was coming in just a few hours. The Father had put all things into His hands, which included everything having to do with His betrayal, arrest, and execution. Jesus knew exactly what was in store for Him – the worst fate anyone could suffer, let alone Him, true God! Jesus was looking forward to His last, greatest struggle to the death – and He knew He was going to lose. Like an athlete the night before a big game, Jesus could have sat back and saved His strength for the ordeal to come. He could have just let this moment pass, or ordered one of the others to wash the feet. But He doesn’t do that. If I were in that same situation – if I knew I was true God and had all things in my hands – I’d probably seize all the evil people in the world and bring them to justice. I’d help those that nobody else spoke up for. I’d end war and hunger and loneliness. I’d make peace between nations. I know I wouldn’t do what Jesus does next. He stands up and takes off His outer clothing. He wraps the rough towel around His waist, and He pours water into the basin. 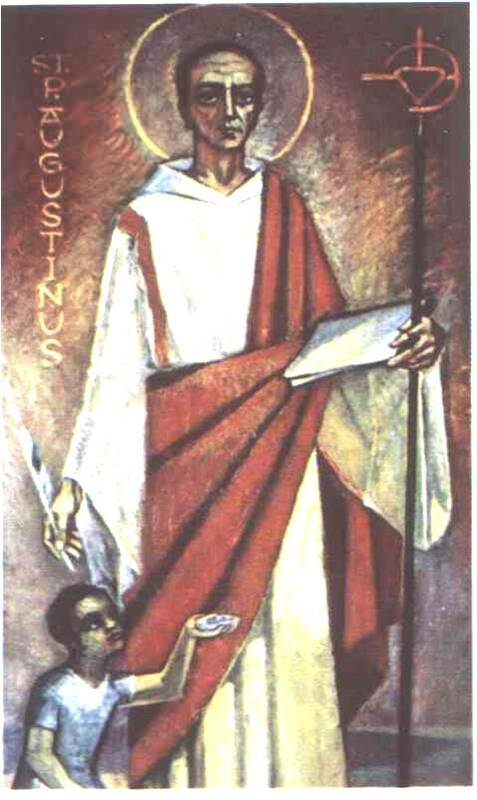 Then He walks over to the disciple closest to Him, which was probably St. John himself, and kneels down. He dips one stinky foot in the water and rinses the dust and grime off of it. Then He washes the other foot. Then He moves on to the next disciple. He goes around the entire table that way. The disciples stop chattering as they watch Him work. As He washes the feet of each disciple, shame seals their lips. Their Master is doing what none of them wanted to do. Soon the only sounds in the room are the rhythmic dripping and splashing of the water in the basin, and the soft rustling sounds of the towel as He dries their feet. What’s most striking about Jesus’ actions here is the way He does them. He is completely humble and unassuming. He doesn’t draw any attention to Himself. He doesn’t sigh, scowl, or mutter under His breath. He doesn’t pretend to hem and haw back and forth before agreeing in exasperation to be the one to wash the feet. He simply sees the need, grabs the basin and the towel, and gets started — even though He was the absolute last person in that upper room who should have been washing feet. Jesus doesn’t let that stop Him. Really, the way He did it was as important as what He did. And Jesus doesn’t let the fact that nobody there deserved to have Him serve them stop Him. 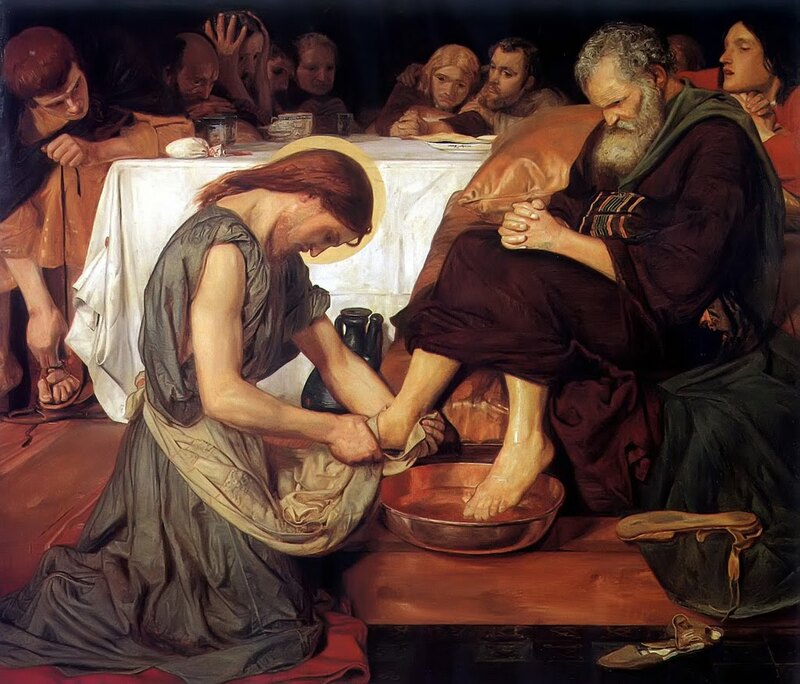 He even washed Judas’ feet. Christ washed the feet of the man who was going to betray Him to death at the first opportunity. If that’s not real love, the kind that doesn’t ask if the other person deserves it and honestly doesn’t care, I don’t know what is. Jesus didn’t hold off on serving in the upper room because He was waiting for some opportunity for a grand gesture. He didn’t tell Himself that He would serve others, if only He found the right people to serve. No, He looked at those right around Him – the people He saw every day – and He picked up the towel. How different than us He is! We’re more like Simon Peter. Jesus gets to Simon Peter, and Peter of course can’t keep his mouth shut. He has no filter, so what he’s thinking comes bursting out of his mouth: “Lord, You’re going to wash my feet? !” His eyes are practically standing out of his head and he’s about to pop a vein in his neck. Jesus softly replies, “You do not realize now what I am doing, but later you will understand.” Peter won’t stand for this. He wasn’t going to wash feet, but then neither should his Lord, he thinks. “You will never, ever under any conditions wash my feet – ever!” His words are vehement and violent. Have you ever noticed how good Peter is at telling Jesus what to do? Before this he’d tried to talk Jesus out of going to Jerusalem to die and rise again, and Jesus had to say, “Get behind Me, Satan!” Here he’s doing it again. He’s trying to tell Jesus what to do. That reminds me of a lot of people I know, starting with the one I see in the mirror. Each of us is great at telling other people what they’re not doing and they should be. Each of us is an expert at noting exactly where everybody else is falling down in their duties – but we never turn that same eye for others’ negligence on ourselves. We all want other people to skip to our lou, to listen and obey when we open our mouths, but we won’t stir ourselves to do something that’s beneath us. We all draw a fine line of “these are the things I will do” and “these are the things that are beneath me.” Usually that line is slanted so others should be doing more for us. If it’s on the list of things we don’t want to do, or we think it’s not our job to do something, forget it. If that’s you – and if you’re like me then I know it is – you need Jesus to wash you. Not just have Jesus kneel down in front of you, take your dirty sweaty foot in His hands that would soon have nails driven through them for you, and dip your foot in the bowl. You need more than that, because this is no mere dirt on your feet that’s staining you. It’s the sin of selfish pride living in your heart. For that, you need a different washing. Brothers and sisters: Repent. Repent of your self-serving ways and your hard heart. Repent of your refusal to serve your fellow man, and you will be clean – because that’s what Jesus promises. The fact is, Jesus has already washed you. You are already clean because He has washed you in baptism. He has cleansed your sinful heart and made you His own. Now you need only to wash your feet and you will be clean. His love for you and me, unworthy though we are, is what guarantees your forgiveness. This is the total picture of love here. In the upper room, with a towel around His waist, kneeling on the floor, Jesus does something that He doesn’t even do on Good Friday. He does something He doesn’t do for the Roman centurions or the Pharisees or the mobs howling for His blood. Sure, He was going to let them open His veins and do all they wished to Him, starting in a few hours, but nobody but Jesus’ followers get this: to have God kneel down in front of them, instead of them in front of Him, and to have God wash their feet. Out of all the things Jesus could have done with His final hours or had them do for Him in His final hours, He chooses this – to do what nobody else wants to do. This was for us. And if this isn’t enough – if His life of love and His death on the cross for your sins and His unhesitating sacrifice of Himself isn’t enough – He’s left you a legacy that you can partake of tonight. He continues to stoop down in service to you tonight, as you come to His altar and partake of the holy Meal He instituted on this, the night He was betrayed. You can come and taste His love for you – the same love that washed feet, heals the sick, and comforts the downcast, that answers your prayers and forgives your sins. It’s here, tonight, for you. Now what will your legacy be as a follower of Jesus the Savior? Think about the people around you every day. Children at our church need Sunday school teachers. Your own children need someone to provide for them and care for them and teach them God’s Word. Your parents need someone to love them enough to do for them what they used to do for you. Your coworkers need someone to cheer them up and encourage them and share God’s Word with them – even if they’re not Christian. Your friends need someone who will tell them God’s truth, even when it hurts. Your spouse needs someone who will support them and not try and score points on them. People you know, Christian or not, ones you know very well and ones you barely know, need prayers so God can help them. What will you do? Will you think, “That’s not my job,” and wait for someone to serve you? Or will you just start doing what needs to be done without asking, “What’s in it for me?” Let Jesus’ question echo through your mind and soul: “Do you understand what I have done for you?” and let the answer be in the way you live – and that will be Jesus’ legacy through you. Amen. Some time after this, Jesus crossed to the far shore of the Sea of Galilee (that is, the Sea of Tiberias), 2 and a great crowd of people followed him because they saw the miraculous signs he had performed on the sick. 3 Then Jesus went up on a mountainside and sat down with his disciples. 4The Jewish Passover Feast was near. 5 When Jesus looked up and saw a great crowd coming toward him, he said to Philip, “Where shall we buy bread for these people to eat?” 6He asked this only to test him, for he already had in mind what he was going to do. 10 Jesus said, “Have the people sit down.” There was plenty of grass in that place, and the men sat down, about five thousand of them. 11Jesus then took the loaves, gave thanks, and distributed to those who were seated as much as they wanted. He did the same with the fish. 12 When they had all had enough to eat, he said to his disciples, “Gather the pieces that are left over. Let nothing be wasted.” 13So they gathered them and filled twelve baskets with the pieces of the five barley loaves left over by those who had eaten. 14 After the people saw the miraculous sign that Jesus did, they began to say, “Surely this is the Prophet who is to come into the world.” 15 Jesus, knowing that they intended to come and make him king by force, withdrew again to a mountain by himself. Three weeks ago at the start of Lent we heard Jesus confess that “man does not live on bread alone, but on every word that comes from the mouth of God.” This was enough to stop the devil in his tracks, so that he had to try another temptation. It also taught us to lift our eyes from things only of this world to those things that are unseen, but no less real – His Word and His providential love and care for us. Today Jesus teaches us the same thing, but not by refusing to make stones into bread – He teaches us to value His Word by making lots and lots of bread. Even though we weren’t there on that day and we didn’t get to eat of that bread and fish, we have God’s Word, the food of our souls, before us today. Soon we will partake of the Sacrament of the Altar, where the true Bread that came down from heaven will give Himself to us. Let’s ponder and think on them now that our souls may be fed and refreshed. Many times you’ll hear people say, “God will never give you more than you can handle.” It’s good to test such statements against Scripture and see if they’re true. Does that idea hold up here? Let’s see: this crowd of people numbers 5000 men, plus their wives and children, so it’s more like 15-25,000, roughly. The disciples don’t have enough food with them to feed everyone, and there’s no place around to buy food. They’re in the middle of nowhere, with no stores or markets nearby. There’s not even any food growing wild where they are that the people could eat, no berries or fruit. Jesus has just made His disciples responsible for feeding this massive group of people, and there’s no possible way the disciples can do what Jesus says here. That’s the main point of Jesus asking this question – so they’ll realize they can’t do what He says. It’s not true that God won’t give you more than you can handle. Sometimes — fairly regularly, in fact — God purposefully gives you more than you can possibly manage on your own, for the same reason Jesus tells the disciples this: so that you will despair of taking care of the situation on your own, so you’ll give up on fixing things by yourself, and instead you’ll turn to God, cry out to Him, and wait on Him for help. Jesus wants you to see how much you need Him, so sometimes He lets you feel the weight of someone else’s need, or of your own. If you’ve ever lifted weights, or watched other people lift weights, you’ll notice that many times there will be another person watching the person who’s lifting the weight. That’s so if the lifter picks the weight up and it’s too much, or their muscles get too tired, they won’t drop the weight on themselves and injure themselves. Sometimes a weightlifter will be too ambitious and pick up too much weight when they’re too tired. They’ll think they can lift the weight, but then they pick it up and realize, nope, I’m not moving that. Sometimes the other person, the spotter, will have to help them put it back down, they’re so weak or tired. God does the same thing with us many times. He lets us feel the weight of other people’s needs, or our own, mainly so we’ll realize how little strength we actually have. Our children need clothing and shoes and food and an education and trips to the doctor when they’re sick, to say nothing of 24/7 love and attention and discipline if we want them to grow up right. Our spouses need our love and attention and help, and it’s not always in the way we think they do. Our families need a lot of help and care and time and attention, which we don’t always have. We ourselves need a lot of help and understanding and support from those around us, and it’s not always there because they don’t have much to give. The weight of human need in the people around us can be oppressive, and our resources are often so meager. The solution is not in ourselves; it’s in God. Jesus proves that here with His words and His actions. Already when He asks Philip this question, our text tells us He already had in mind what He was going to do. Even before He asked the question and led His disciples to realize what they couldn’t do, Jesus knew exactly how and what He was going to do to fix the problem. That’s impressive and it should be encouraging to us, because Jesus knows exactly what you need and exactly how He’s going to give it to you. He is not unaware of your needs, and He has ways of filling them that you can’t even conceive of. Which of His disciples, or who among the crowds, could have imagined what Jesus would do next? Jesus has everyone sit down on the grass, which must have told the disciples that something was going on, because people sat down to eat and there was no food yet. If the lightbulb didn’t go on for the disciples at that point it did in a moment. He took a little boy’s lunch – five small barley loaves, poor people’s food, and two small sardine-sized dried fish – and He gave thanks for it, to remind us where everything we have comes from. Then He begins to hand out the food to the disciples, and the disciples handed it out to the people. Jesus kept passing out the food, and the disciples kept passing out the food, until all 20,000 or so had eaten as much as they wanted. I don’t know about you, but five dinner rolls and two sardines wouldn’t go too far with me, and I’m just one person. Yet Jesus fed all those thousands of people until they all said, “Oof, no more for me, I’m stuffed,” to the disciples as they went around with the food. Then to cap it all off, and to drive home what He’d just done, Jesus told the disciples, “Gather the pieces that are left over. Let nothing be wasted” – and they gathered twelve big baskets full of leftovers, when they’d started with not even enough food to fill half of one basket. It had to have dawned on the disciples, as they stood there each holding a full basket of scraps, what Jesus had done, and how easily He had fed thousands with the ancient Jewish equivalent of a Happy Meal. So what are we supposed to learn from this miracle? We weren’t there, we didn’t eat the bread and the fish; what is Jesus teaching us here? First, that He truly will take care of us, and He has the power to do so! Whether it’s through ordinary means, like our own hard work, or even once in a while through miracles or unexpected means, Jesus takes care of us. We marvel at Jesus feeding the 5000, but every year the fields give their harvests, the trees bloom and bear fruit, the animals have their young and grow, and we don’t give it a second thought. The rain falls, the temperatures change with the seasons, and even if they’re not exactly what we think we need, somehow we always get enough to live on out of the whole deal. You’ve seen that. You know that for yourselves. God will take care of us, just as He always has – so why would we worry? “I have never seen the righteous forsaken, or their children begging bread,” David says in the Psalms. “As long as the earth endures, seedtime and harvest, cold and heat, summer and winter, day and night will never cease,” the Lord pledged after the Flood, and His promises are still coming true for us today. Secondly, Jesus shows us here how easily He can take care of us so that we’ll pry our attention off of the things of this life and give some thought to the things of God. We spend so much time thinking about “what are we going to eat, what are we going to wear,” and all the other concerns of earthly life. Jesus says that the pagans, the unbelievers, run after those things – but you, “seek first His kingdom and His righteousness, and all these other things will be given to you as well.” Not that we shouldn’t pay any attention at all to our physical needs – that’s not what Jesus is teaching us with this miracle – but that we shouldn’t pay all our attention to our physical needs. Jesus sets you free from constantly worrying and thinking about this life, so you can pursue life with God. You don’t have to be consumed with providing for yourself and your family; God has promised to do that. After He does this miracle, Jesus says something that doesn’t seem to fit at first: “Gather the pieces that are left over. Let nothing be wasted.” Why would He tell the disciples this, if He can just make more food? Because Jesus doesn’t want us to waste anything He gives us – not His physical gifts, and even more than that, not His Word. Here today God spreads a rich feast for you in His Word. You hear God Himself speaking to you through Scripture. He feeds your faith with His Word, and when you go home today, He’ll most likely give you another whole week of His grace – six more days full of opportunity to fill up on His Word; to ponder it, meditate on it, feed your soul with it. What will you do with all this great spiritual food Jesus is spreading out for you? Will you fill up your soul to your heart’s content and really learn to know your God? Will you gather up even the scraps, so that nothing is wasted? Or will you pick at His Word here today and then leave most of the food on the table the rest of the week? Will you grab all of His everyday, earthly gifts and ignore what you really need – His Word for your own heart? Take time this week to feed your soul — gather up the scraps, too. Let nothing be wasted! 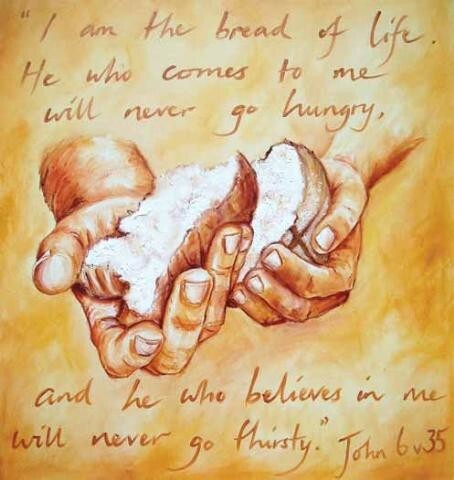 In this Gospel Jesus gave bread to thousands in a miracle, just as He gives daily bread to all people every day. Here, today, you can have the most precious Bread of all – the Bread of life that came down from heaven, which a man may eat and not die. His flesh is real food and His blood is real drink. Today Jesus gives Himself to you, all of Himself, to satisfy all the needs and longings of your soul. Will you turn away from this Bread, from God’s Son? Will you say, “Nah, no thanks, not hungry?” Or will you eat and drink and be satisfied? Jesus promises that if you come to Him, you will lack nothing. I pray that each one of us who is able will come to His table today, and see how true that is. Jesus gives you everything you need. Believe it and give thanks. Amen. Mercifully perfect within us, we beseech Thee, O Lord, the support of Thy holy observance: that what, by Thine instruction, we know we are to do, we may be enabled to accomplish by Thine assistance: through Jesus Christ, Thy Son, our Lord, who liveth and reigneth with Thee and the Holy Ghost: ever one God, world without end. Amen. The kicker in the Christian life is always: how are you going to get there? How are you going to actually do what God wants you to do, and what you know is right? This prayer points to the answer: “it is God who works in you both to will [i.e. to desire, purpose, plan] and to do His good pleasure.” Without His help we never advance in sanctified living or make any gains in our lives of faith. The gains may be imperceptible most days, but they’re there. He promises they are, if we try to be faithful. The Epistle for today is I Kings 17:8-16, the account of the widow of Zarephath whose flour and oil did not run out. 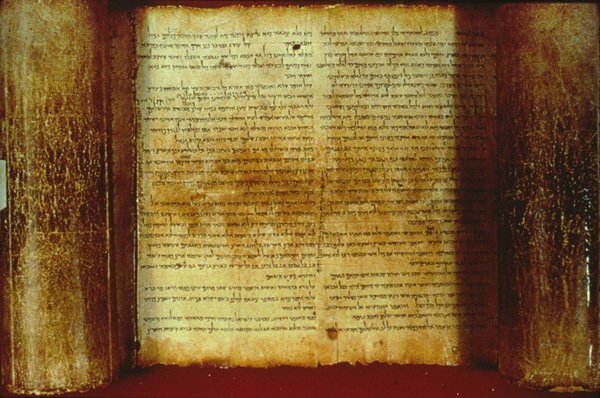 The Old Testament often states through narrative or pictures what the New Testament might say propositionally or more abstractly, and this account is a good example. Here God’s providence and daily care are vividly seen as the widow’s flour and oil — the very staples of their existence — never give out. Just as the widow was able to give bread every day to those in her house through God’s providing, so also we have the blessed Sacrament for our frequent nourishing, strengthening, and comfort in faith. Many think that if they come to the Sacrament more often, it will be less special…they’re wrong. The opposite is true. Nothing is more precious, beautiful, or consoling than the holy Supper of my Lord Jesus. Words cannot express the comfort this blessed Sacrament has given me. It’s gotten me through a lot and I know it will always be there through a lot more. The reason it’s so dear to me, and to countless Christians throughout the world, is simply for one reason: it’s Jesus. That’s it. Where Jesus is, there can no longer be any sin or death or shame or guilt. “All grief must flee before His face/ And joy divine will take its place” (CW 32:1). There is only forgiveness and light and peace and joy. I sometimes wish more people thought about that or remembered it more often. It brings comfort beyond words, to have Jesus for yourself in this way. Getting back to Elijah and the widow of Zarephath, it’s interesting that he asks her to feed him first. This is a gut-level (pun only partly intended) test of faith. Will she take the prophet at his word, which is God’s Word here? Or will she give in to fear and take the safe way, and still not have enough? She doesn’t give in to fear. She feeds the prophet first, and her faith is rewarded with continual sustenance for herself and her house. Faith is God’s work in us, but after we’re brought to faith it’s also a choice at times. By God’s grace we make the right choice to continue in our faith, instead of living from our fear or our foolish human logic or some other safe-seeming but misleading substitute. That should do it for today. 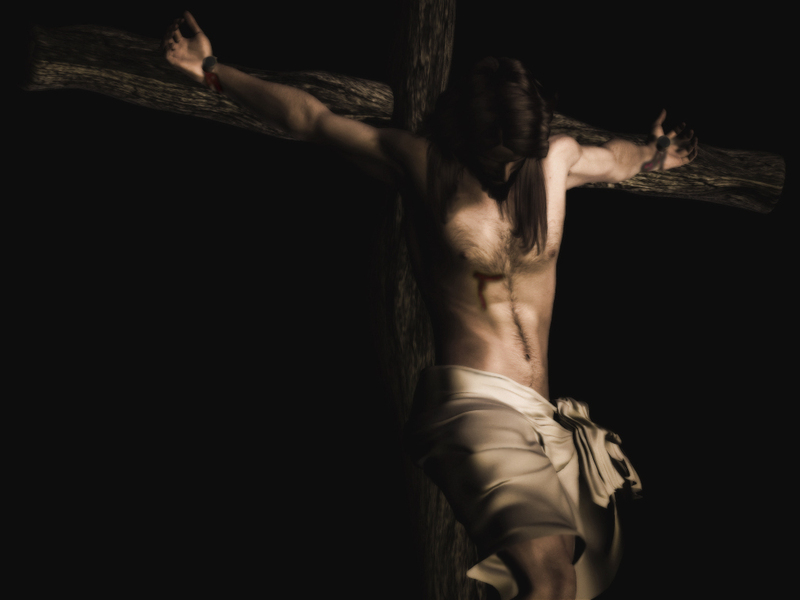 May Jesus grant you true repentance and faith in His most holy Passion for you. Amen. WHAT parent could take the children’s food and throw it to the dogs? For the hunger of children is simple and obsessing. When they are hungry there is nothing that they want but food, and until their hunger is relieved, they have no mind for anything else. Their present mind is their hunger; they are their hunger. How happy are parents in the ability to bestow contentment so simply and so fully, as by giving the children the children’s bread. And now in the name of the divine Father I must take bread, say grace for it, and distribute it. But when it comes to distribution, I shall find myself in the children’s part; we shall receive together, as though from those merciful hands. The mercy of heaven rejoices to satisfy the children’s hunger with the children’s bread. Their hunger is for this, and this is what satisfies. What happiness, therefore, to the giver. And the children are happy if they hunger for this bread, if their hunger possesses them, until their hunger is their mind. Blessed are they, says Christ, that hunger and thirst, for they shall be filled. And Christ is best able so to say, being himself the bread.